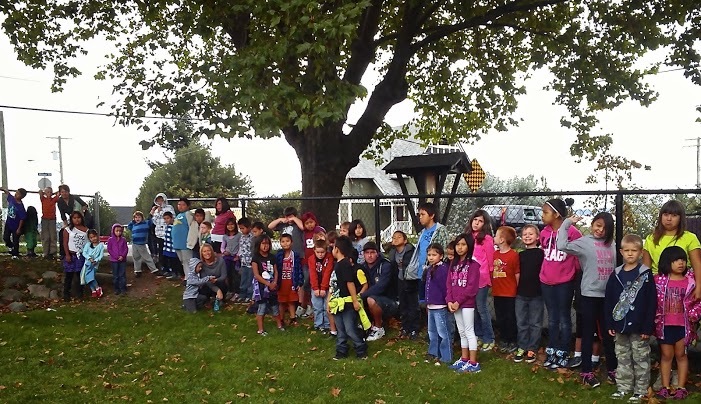 A public art project by Bayview Elementary School at Deverill Square Park. IMAGINE CREATING ART FOR THE PARK! PAINTINGS ON THE FENCE LINE! My name is Yvonne Vander Kooi. I’m a local painter & muralist & will be coordinating a public art project for Deverill Square Park with Bayview Elementary School & neighborhood residents. The project is inspired by the Little Hummingbird story by author & artist Michael Nicoll Yahgulanaas. Bayview Elementary School has adopted this simple yet moving parable that expresses the power of taking small steps to achieve a big goal. The art will be inspired by themes and images from the story & convey how small contributions, when added to the whole, can have a big impact & make a big difference. 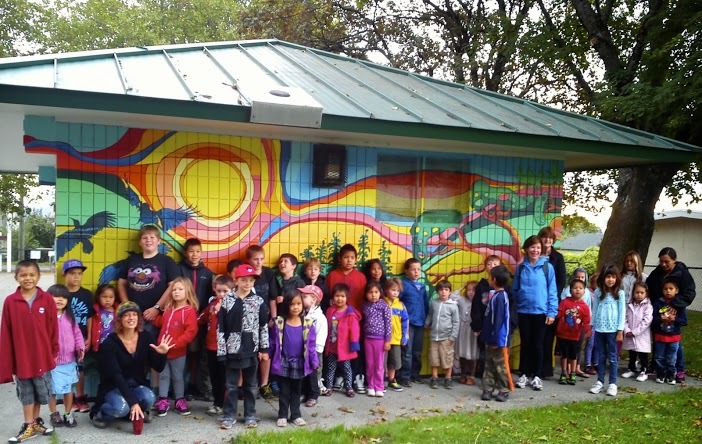 There will be opportunities to participate in the project either by painting one of the 250 panels, volunteering in the art workshops, and/or coordinating the installation and celebration of the project at the school & park. Bring your paint shirts! 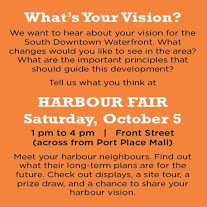 Bring your ideas, find out more about the project & how you can participate to the Open House at Bayview Elementary School on September 26th at PM, email me yvonne.birdstudio@gmail. As we bumble into one of stormiest weekends forecasted this fall, it seems that we must either rename our South End event to “Chalk Smears” or chalk it up to experience, make a hot cup of tea and take advantage of the extra nine months to gestate more ideas for sidewalk drawings on July 1st. Personally, I’m opting for the latter. It seems that many people were thinking about this already since the number of hardy souls who registered is exactly two. There was also an unregistered plan for several South Enders to chalk up the asphalt at Deverill Park. Alas – tis not to be. Way back in July and August, when we saw nary a cloud and rain seemed a thing of the distant past, we thought September would be just another month in an endless stream of sunny Pleasantville days. But coastal realities are here again and the sidewalks are wet, wet, wet! So, dear friends, let’s settle in with soup and socks and dream of next year…we’ll chalk together next year. 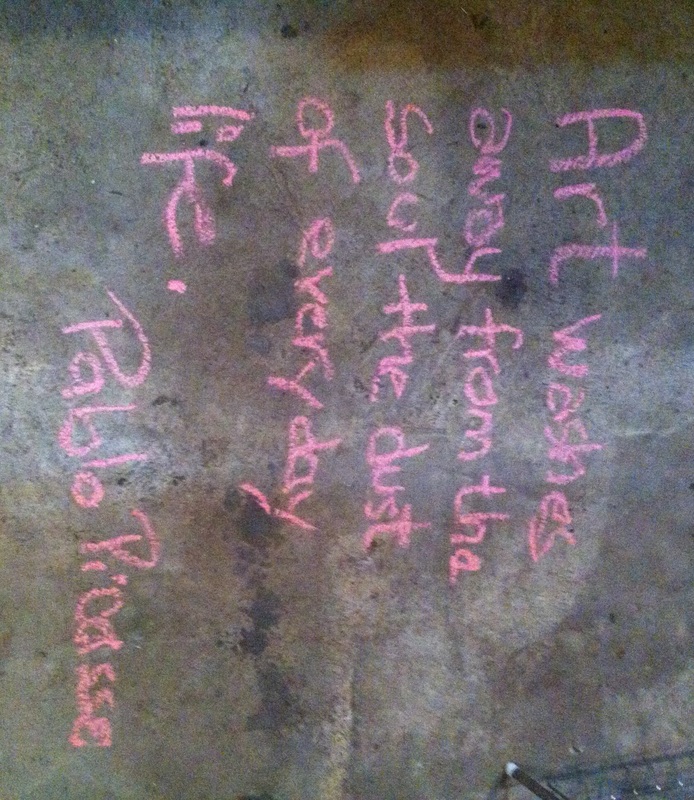 In the meantime, during any dry moments over the winter you can always run outside and hastily lay down a little chalk note and picture for the passerbys…or head to your basement as we did this morning. Cosy, warm wishes to all! I must admit to more than the occasional twinge of guilt as I drive by Tong’s Grocery at 707 Haliburton Street, heading for the mall and yet another bulk buy of groceries. Tong’s is an old south end institution and represents one of a dying breed of neighbourhood grocery stores that have somehow survived the dramatic changes in our shopping habits. 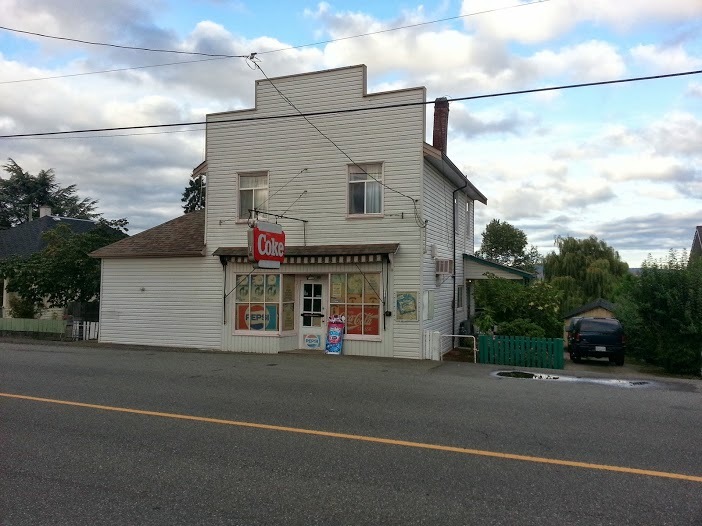 Kim and Ed Wong took over Tongs in 1991 and continued a tradition of serving groceries, snacks and sundries from this store that stretches back to the 1890’s. Although I’ve followed the herd to the supermarket for my family’s grocery shopping, Tongs has played a lovely part in our family life, serving as our essential ice cream destination and giving the kids their first independent shopping experience when we’ve run out of some staple or other, “and don’t forget to say thank you…”. I was chatting with Ed the other day and he talked about the challenges they face in keeping the business running. At times, he and Kim have had to supplement their income through other jobs and they have had to work long hours, seven days a week, to stay afloat. Despite the challenges, they have managed to pull it off and along the way raise two fine boys, one currently in university and the other a Masters level mathematician with Stats Canada. One of the great things about having a neighbourhood store like Tongs is that you can walk there. This is important if you don’t have a car, (a reality for many south end families), but you also get to chat with neighbours on the way, envy their gardens, catch up on the gossip and generally feel part of the neighbourhood. “Liveability” is the urban planning catchword and any neighbourhood design charrette that I’ve attended always seems to include an abundance of small, pedestrian friendly stores like Tongs. My question is this: if I care about the viability of a store like Tongs, what am I prepared to do about it? Anyone for ice cream? Well, the South End Chalk Walk rapidly approaches. The plan has been to chalk on Saturday the 28th and/or in the morning of the 29th of September, with the Chalk Walk starting on Sunday September 29th at 10:00 am. Perhaps one of the “chalk it up to experience” pieces here has been that this ain’t the best time of year to plan a Chalk Walk. Lesson learned: it would probably be better to do this in the summer when the chances of sun are a bit higher. Next year the plan is to hold the Chalk Walk on Canada Day on the July 1st weekend, so mark that on your calendars! 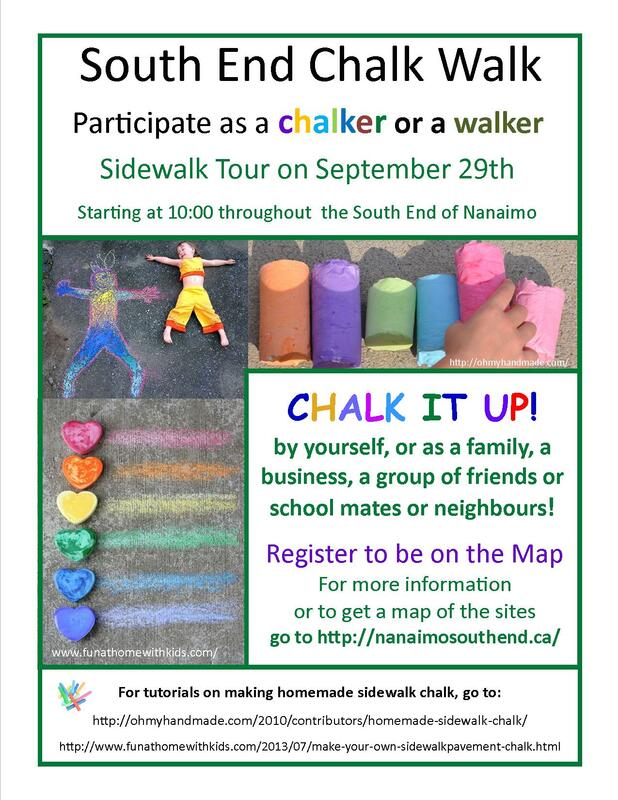 In the meantime, stay tuned to http://nanaimosouthend.ca/ for up-to-date information on the Chalk Walk. If it is raining – well, many of us will probably opt for the great indoors, tea and a good book…but if the skies are dry – watch out for random acts of art around the neighbourhood – particularly in Deverill Park. The Nanaimo branch of the Women’s International League for Peace and Freedom ( WILPF) would like to address your next council meeting to request that Council direct staff to put back or replace the signs at the entrances to Nanaimo indicating that Nanaimo is a nuclear weapons-free zone. On June 8th, 1987 the City of Nanaimo adopted Bylaw # 3199 which prohibits the manufacture, transportation, storage and distribution of all nuclear weapons and components of nuclear weapons in the city of Nanaimo. In October 1989 Council was approached by VANA, Veterans Against Nuclear Arms, requesting the installation of signage at the entrances to Nanaimo indicating that Nanaimo was a nuclear weapons-free municipality. These signs were designed and put in place but by 2003 had gone missing. When this was brought to the attention of Council, staff was directed to design new signs for the three entrances to Nanaimo. The signs which read “Welcome to Nanaimo, a nuclear weapons-free zone “ were simple and attractive. Unfortunately they have disappeared within the last few years. Our womens peace group , which has organized the Hiroshima Lantern Ceremonies in Nanaimo for the last twelve years, feels great pride in our city’s status as a nuclear weapons- free city. We would like the signs put back so that everyone entering our city feels the same pride. As Nanaimo citizens, it is an important part of who we are. 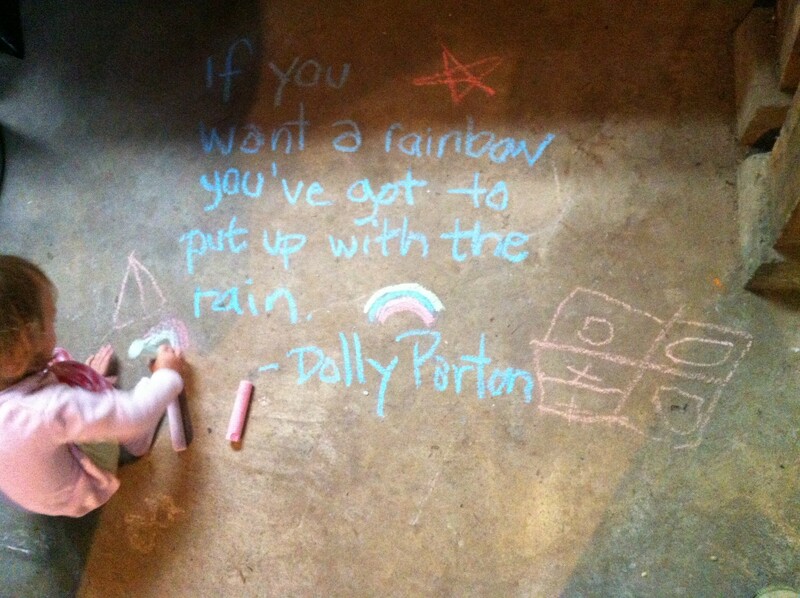 Who’s excited for the Chalk Walk? Cross your finger and dance for sun!